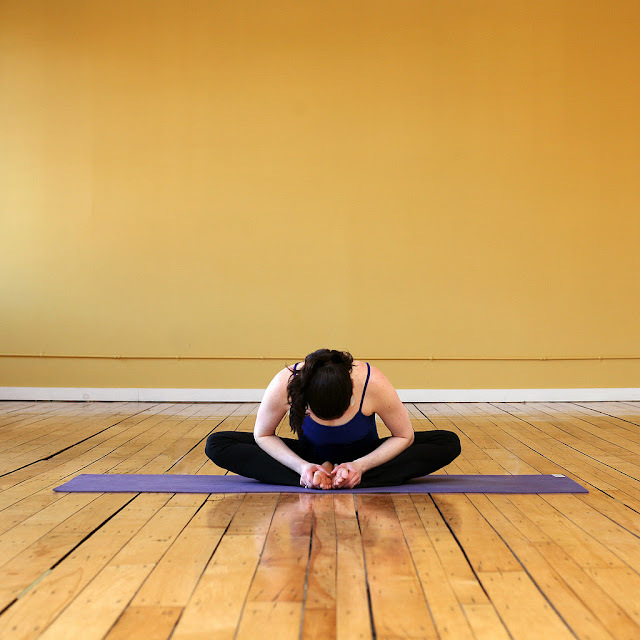 Once you've come out of Bridge Pose, sit up and place a folded bolster, blanket, or pillow against a wall. Sit down as close as you can to the wall, next to the blanket. Lie down on your back, place your feet on the wall with your knees bent, and scoot your body over so that your bottom and lower back are on the blanket. Bend your right knee, and place the sole of your foot against your inner thigh, pulling your heel as close to your body as you can. Either support the weight of your torso with your hands on your legs or feet, or rest them out in front of you. From Standing Forward Bend, slowly roll up vertebrae by vertebrae until you're standing at the top of your mat. Yoga before bed can be some of your best defense against insomnia. By calming down your body and your mind, you're putting yourself in a better position for sweet and restful slumber. Ready to get to bed? This yoga sequence will save the day.